• Opening Day & Summer Opening Day - April 4 & June 8 Doubleheader: It's Opening Day! Shout it from Fleetwood's Rooftop, and mark it on your calendar: Thursday, April 4! But wait, this day is sooooo fun we're celebrating it again on Saturday, June 8 at our new 'Summer Opening Day! Kickoff the season on April 4 with rooftop parties, Opening Day Brewfest in the Home Run Terrace, and the rockin' Hensville Block Party. Then do it all over again on Saturday, June 8. The 'Summer Opening Day' doubleheader on June 8 will feature inflatables, fireworks, live music, and a special guest appearance by the high-energy driven balancing act, the Amazing Tyler. Ticket packages with both 'Opening Days' are available now (that's three games for the price of two!). • Rock 'N' Blast - July 3: Salute the U.S.A. at the July 3 Rock 'N' Blast Mud Hens game and fireworks show. 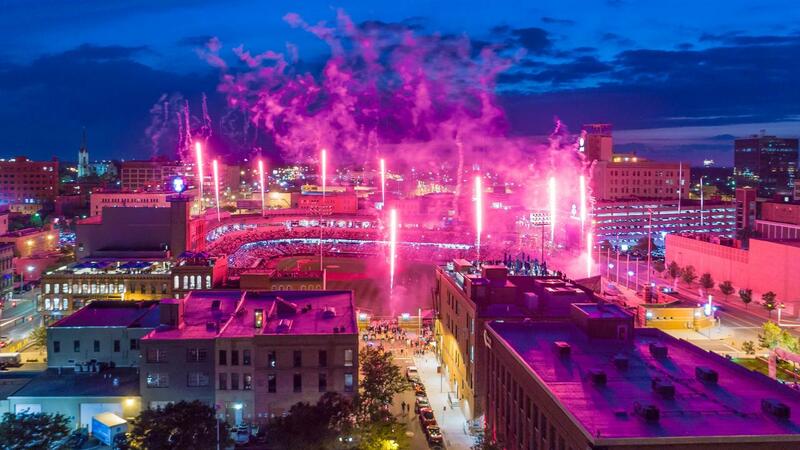 If you have never seen a postgame firework show, THIS IS THE ONE. The Rock 'N' Blast postgame fireworks extend around the ballpark to create a visual performance unlike any other! The 20-minute show, synced to music, features fireworks shooting from the Fifth Third Field warning track and Monroe Street. You have to see it to believe it. • Labor Day Picnic - September 2: Celebrate Labor Day and America's favorite pastime at the final regular season Mud Hens game of 2019. Hensville Park will have activities for the family and Muddy will be throwing a party with a huge picnic feast. • Sunday Brunch with Muddy and Muddonna - Select Sunday's during the 2019 season: Sunday brunch. YUM. But we're not stopping there. This season, on select Sundays prior to the Mud Hens game, brunch will include appearances by your favorite oversized birds. Add in 'Muddy and Spike's Inflatable Theme Park' in Hensville, pregame player autographs, and postgame Kids Run the Bases, and there is something for every age. Dates: April 7, 21; May 5, 19; June 2. • Paws and Pints - May 31: We're taking two fan favorites and combining them into one great event. On Friday, May 31, bring your dog to Hensville Park and have a beer before taking in a Mud Hens game. Proceeds of the dog tickets will benefit Toledo Area Humane Society and Lucas County Canine and Control. • Inflatables Festival - August 31: This is what happens when you take a popular promotion and inflate it even more. The end of season 'Inflatables Festival' will feature 15 inflatable games in Hensville Park and on St. Clair Street! Plenty of fun for the adult who still wants to be a kid, and the kid who just wants to play, play, play. • Beer, Wine, Spirit Tastings: You asked. It's happening. This season wine and spirits have joined our beer tastings lineup. Get ready to swirl, sniff and sip your way through pregame. • Holy Toledo! Rooftop DJ Party - After every summer Friday and Saturday home Mud Hens game: The fun continues after the final out is called. It's 'game on' up on the rooftop at Holy Toledo! where a DJ will be spinning tunes from 9 p.m. to midnight after every Friday and Saturday home game from Memorial Day Weekend through the end of the season. • Star Wars Weekend - May 4 and 5: The forces have aligned. 'May the Fourth Be With You' on May 4 and 'Return of the Fifth' on May 5 line up with Mud Hens game days this year: Holy Obi Wan Kenobi! • Wizard Weekend - June 1 and 2: Fifth Third Field will transform into Diagon Alley once again as we bring back the most magical weekend of the season. Accio fun! • Hensville Live! Postgame Concert Series - After every summer Friday and Saturday home Mud Hens game: Fleetwood's Tap Room's popular free postgame music series in Hensville Park returns for its third year. The shows happen after every Friday and Saturday Mud Hens game starting Memorial Day Weekend with bonus holiday dates. • Hens & Hounds Nights - April 20, May 31, June 30, July 31, August 30: Special five-game 'Hens & Hounds Ticket Package available now! Single game tickets will go on sale in February. Game plan memberships are available now! Download the 2019 Mud Hens schedule here.